Everybody's Christmas favorites and more, done by two voices that will touch your heart and raise your spirits, with sweet acoustics on mandolin, 6 and 12 string guitars, accordion and drums. 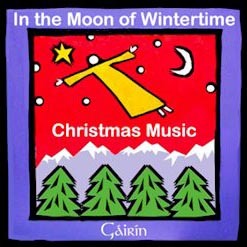 Enjoy acoustic music by Gairin this Christmas. This CD includes the original song Christmas Shoes: a sentiment for those with loved ones at far away military bases and away from home and family over the holidays. This popular folk duo got their start performing at Renaissance faires in California and Nevada, as founders of the 12-member Early Music singing group The Motley Madrigals. Find out more on the Gairin Music web site. Allow: 2-3 Days for delivery.